Revive the original shine of plating parts. Metal Plating Polish is specifically designed to remove dullness on plating parts. The product is also very effective for water spots removal and a situation that black-color chrome window frames became clouded. By polishing with Meal Plating Polish, there will be no damages and scratches on materials and an application is simple and quick with the quality. Metal Plating Polish is specifically designed to remove dullness on plating parts. The product is also very effective for water spots removal and a situation that black-color chrome window frames became clouded. By polishing with Meal Plating Polish, there will be no damages and scratches on materials and an application is simple and quick with the quality. Cars are embellished with plating parts to look attractive. However, they can also make cars look less attractive when plating parts lost their shines. When plating parts are shiny, they look like a mirror. When plating pars are getting dull, apply Metal Plating Polish to restore their original shines. Water spots and cloudiness on black-color chrome window frames are very remarkable. If you leave them for a long time, those dirt become more difficult to be removed so that it is recommended to take actions for them as soon as you notice. If you apply the product on surfaces with dusts, it might cause scratches. Please make sure to wash and clean up surfaces before an application. 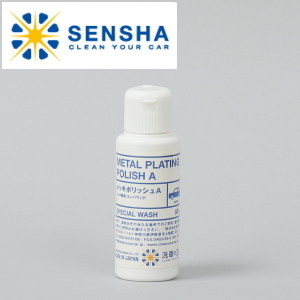 Metal Plating Polish contains 2 types of agents. Which to use is based upon a condition on plated parts. The initial polishing with “Liquid A” and the finish polishing with “Liquid B”. Cloudiness and dullness of black-color chrome window frames become more severe when time passes. Metal Plating Polish performs its advanced capability by the combination of 2 types of agents with 2 types of sponges. Restore plating parts conditions with “Liquid A” and finish with “Liquid B” to boost shines. This product is the polishing compound for plating parts. When using Felt Sponge, please first allow solvent to soak in fully up to the edge part. A condition of plating parts is restored by polishing vertically and horizontally with care. Some plating parts conditions might not be able to be improved.